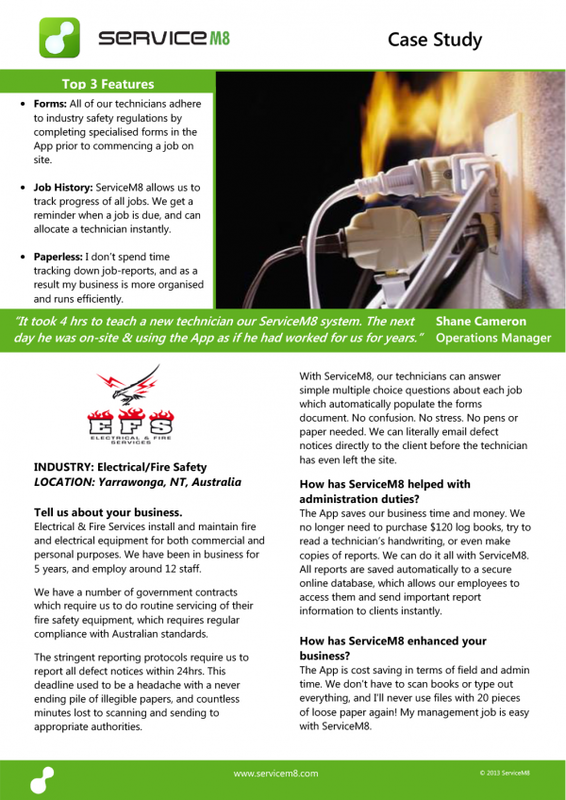 ServiceM8 is a powerful iPhone and iPad app used by 14 000 businesses globally to control work from a client’s first call through to invoicing. ServiceM8 manages and coordinates the interactions of a business between its staff and its clients, simply and cleverly. Small businesses have moments of brilliance every day, but their innovations are rarely shared. Our vision is to empower all small businesses by sharing their collective wisdom. ServiceM8 is developed and maintained by a small team of dedicated people who collaborate from different points around the globe. With ServiceM8, you’re connected. Urgent jobs can be dispatched to staff immediately, and without phone calls. 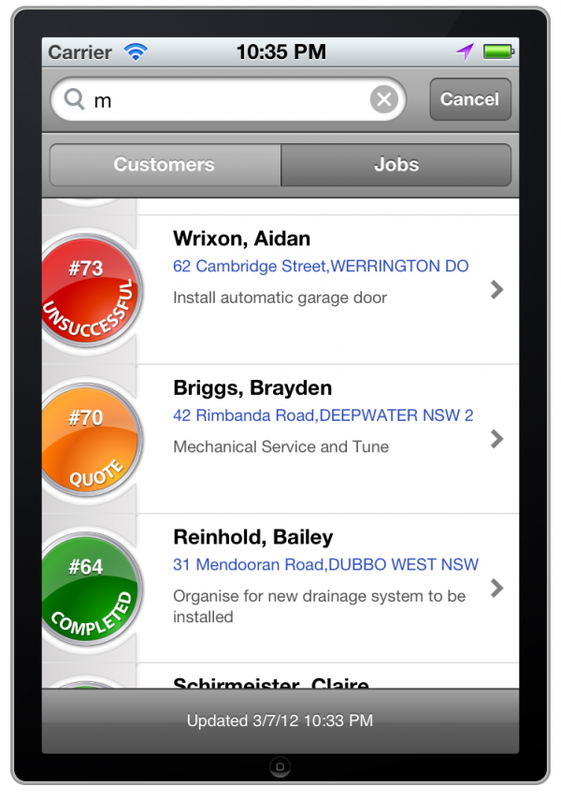 Staff on the road receive all of the client details and job badges assist in highlighting critical information. Staff can access turn-by-turn navigation at the tap of a button so they won’t get lost. Clients can be automatically notified via SMS that you’re on the way, and because you know where staff are at all times, you can work even smarter. In ServiceM8, every job has a story. From a client’s first call, every note, photo, email and text message is stored in the job diary for reference. Staff have a complete job history available on the road, even when out of coverage. Staff have clear job requirements, and with checklists and tasks, jobs are done right the first time, every time. Invoicing with ServiceM8 is magic. With the ‘Quick Picks’ feature, creating invoices on your iPhone takes seconds. 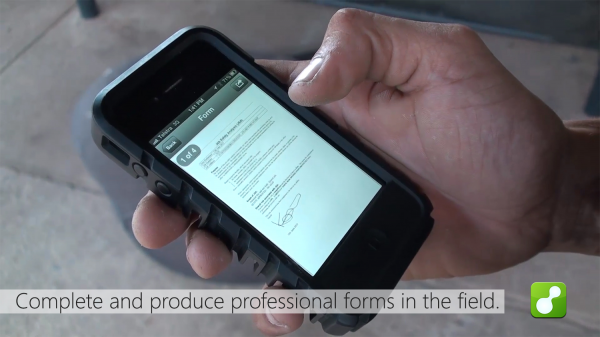 Print, email and even post professional invoices directly to the client straight from your iPhone and inspire confidence. ServiceM8 innovation starts with the software platform backing up of every client database, in the background, every 5 minutes. ServiceM8 uses a unique infrastructure incorporating innovative technology that removes the requirement for maintenance downtime. All client and system upgrades are completed in the background, in real time, and without any interruption to service. This combination of technologies means the service is very robust. Servers manage their own health, load and existence ensuring optimal performance. This world class hosting and backup system gives small business peace of mind. 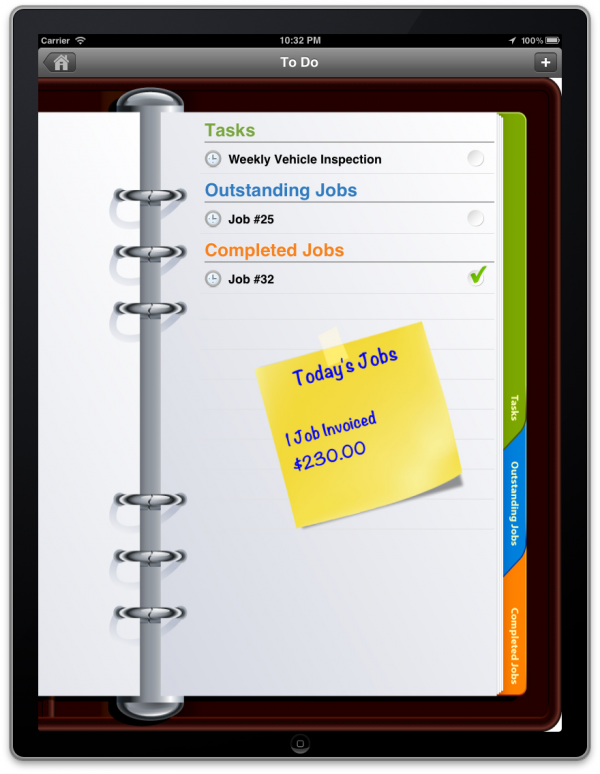 In the app, the innovation focus is on saving time and effort, increasing professionalism and improving consistency. ServiceM8 makes extensive use of customisable templates making tasks and documents repeatable. Although not innovative in themselves, completed templates play a vital role in leveraging ServiceM8 capabilities like sms invoicing and complex forms. Business specific forms like JSA and Vehicle Maintenance are completed via a series of branching questions, with the results populating a PDF document based template. The result, a complex, professional document consistently completed while on the job. Furthermore, ServiceM8 features a range of add-ons, providing business or industry specific functionality, all activated the tap of a button. At ServiceM8, we like to hear our clients say “Wow, I didn't know ServiceM8 did that, I didn't even know I needed that feature until today”, and we hear that a lot. ServiceM8 reflects a user experience that is intuitive, appropriate and instructive. For example, we don't provide a specific button for checklists or job tasks. If a checklist is required, simply prefix the instruction with a dash when filling out the job requirement and ServiceM8 turns the instructions into a list of tasks with completion buttons ready to be ticked off by staff. Helpful when needed, but invisible when not. 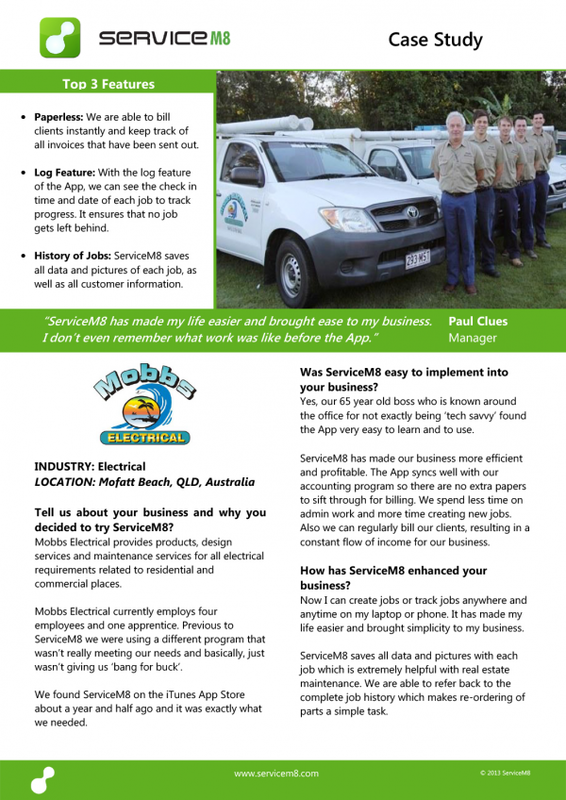 “ServiceM8 has streamlined our invoicing and receipt process, which has resulted in less administration work from 8hrs/day to 2hrs/day! Now we have more admin time available to value add to our business, such as follow up work with clients. This leads to more customer satisfaction.” Mark Chaberman, Owner of Crystal IT Solutions. “It could take a couple days, weeks, or even a month to get a report to a client. Now, we can invoice, report, get payment and signature from client immediately on site. It has increased our cash flow, and our business is more efficient.” Graeme House, Managing Director of Havensafe, Corpsec and Geoffrey Australia. “ServiceM8 has actually cut our admin time by over 50%! I’ve gone from spending 4-5 days in the office to only spending 2.” Jade Wortmann, Owner of Bone & Wortmann Electrical. Our marketing strategy is loosely based around the gaming industry strategy of engagement leading to commitment. We use google and facebook to target potential clients in a specific age group and sector to attract the right clients from the start. Our initial contact through the signup process is designed to be instructive as well as engaging and we make extensive use of AB testing to optimise and target our message. This testing also provides feedback on potential roadblocks. Once signed up clients are given context appropriate help via smart emails. As the client progresses to business integration, we assist through our helpdesk, partners, blog and articles, making the process as painless as possible. We have no trial period so our clients don't feel pressured to make a far reaching business decision quickly. 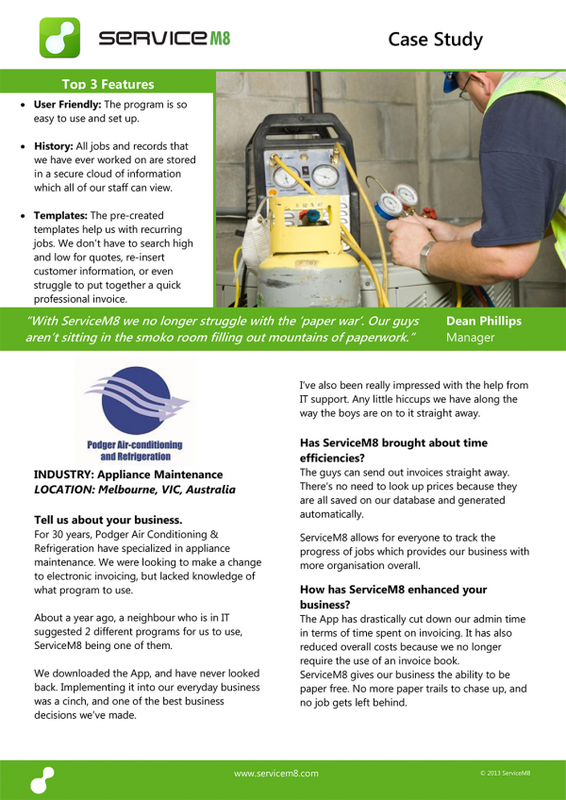 And with 20 free jobs every month we compensate clients for trial jobs and some small businesses can use the full features of ServiceM8 without charge. In the end, we couldn't think of a better way to show our commitment to improving our client’s business than to charge based on success. There's no incentive for a fixed-fee provider to go the extra mile to assist in completing more jobs. With ServiceM8, it's in our interest not only for our clients to succeed, but to grow - and with no contracts, we re-win our clients on a monthly basis.